LOST MY PARTNER blog: i hate the word "widow"! i hate the word "widow"! As if going through the death of a spouse/partner wasn’t difficult enough, you’re suddenly labeled by everyone as a “widow” as soon as the death occurs. Unfortunately, there have always been negative stereotypes about what it means to be widowed. Keep in mind that many of these old stereotypes probably continue to influence how you and others see your changed status. Like all aspects of a new identity, it takes time and baby steps to increase your sense of who you now are and how you want to define yourself. it hit me when I got the revised car insurance policy - Status widow. I cried out "I'd don't want to be a widow, I want to be a wife!" what hit me was when I got the revised car insurance. It said Status: widow. I cried out, "I don't want to be a widow, I want to be a wife!" What about partners who don't even get to use the word widow? 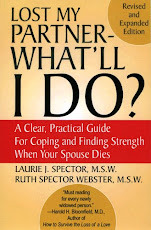 What about partners who do not get to use the word widow? I hate the word widow. It tastes bitter coming out of my mouth. I might as well have said I have leprosy. The reaction from others is about the same. am I responsible for my spouse’s debts?